India’s leading video streaming platform Hotstar is offering an annual membership plan at Rs. 1,200 to new subscribers. The amount represents a 49 percent discount over its standard subscription price of Rs. 199 per month. The company is also offering a 6 month pack for Rs. 894, a Rs. 300 (25 percent) discount, and also a 3-month pack for Rs. 498 that will save you Rs. 99 (16 percent off). There’s no word presently on whether these plans are time-limited or are here to stay, but the company had also earlier announced similar offers on a promotional basis. In fact, the company had also offered a one-year subscription bundle for as low as Rs. 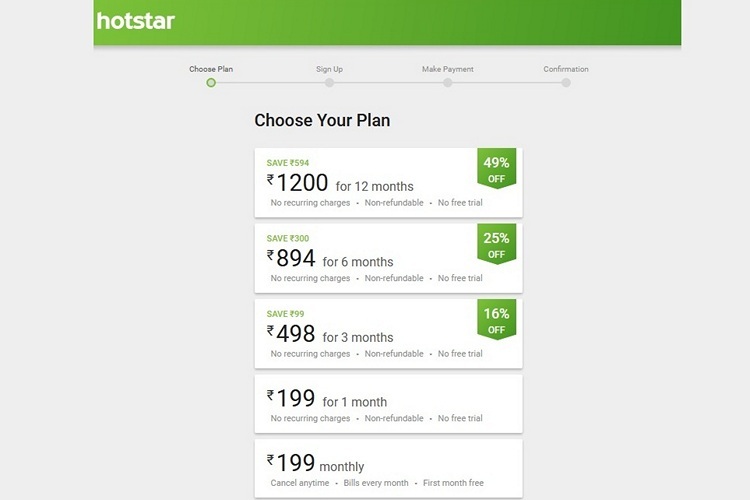 696 last September, but given how that particular offer is unlikely to make a comeback any time soon, this is as low as Hotstar Premium subscription is likely to get for now. As revealed by Counterpoint Research late last year, Hotstar is presently one of the most popular streaming apps in the country, thanks largely to popular American TV series, Game of Thrones, which is broadcast in the US on HBO. While the series is technically available on Star World in India, viewers are only treated to a censored version that misses out on most of the action that makes it a must-watch program on American TV. Fans unwilling to accept the censored version mostly resorted to downloading torrents illegally in the pre-Hotstar era, but are increasingly starting to subscribe to Hotstar Premium for access to the full version. The platform also streams cricket matches and Indian television programs, making it one of the biggest threats to the likes of Netflix and Amazon Prime Videos in the country. You can click here to subscribe to Hotstar on the company’s official website.